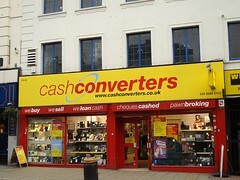 As of 2013, 12 London Road is a branch of H&T Pawnbrokers, the pawnbroker and payday loan shop chain, and 14 London Road is a Ladbrokes betting shop. Given the intertwined history of these addresses, I’ve decided to cover them in the same article. Although now occupied by separate businesses, the premises were constructed as a single building, and the ground floors of both were initially used by a single business. H&T Pawnbrokers at 12 London Road and Ladbrokes at 14 London Road, February 2013. Photo: author’s own. The current building was constructed in the mid-1920s, on a site previously occupied by a building associated with West Croydon station. The older building was originally the administrative offices of the London and Croydon Railway company, and later used as the stationmaster’s house. It was eventually demolished in 1924, “to make room for improvements”. Advertisement for John Bright on the front page of the 15 November 1930 Croydon Advertiser . Reproduced courtesy of the microfilm archives at the Museum of Croydon. The first businesses to move into the newly constructed premises were John Bright Outfitters and Embassy Billiard Hall, which are first listed in Ward’s street directories for 1925 and 1926 respectively. These were initially not numbered, then listed as “Station House”, and finally given the numbers 12–14 and 14a, respectively, in the London Road renumbering of 1927. John Bright occupied the ground floor of numbers 12 and 14, and the billiard hall was on the first floor. John Bright moved out some time between 1933 and 1937, into the new parade of shops that had recently been built on the other side of West Croydon Station. Number 12 was taken over by another outfitters known as N Davis Ltd, while 14 remained vacant. However, N Davis only lasted a couple of years; by 1939, number 12 was occupied by a business called Nu-Enamel and number 14 was home to Mason’s Cooked Food Stores. I don’t know what Nu-Enamel did, nor how long it and its neighbour stayed there, as street directories are sparse during the Second World War. The Ministry of Labour & National Service at 12 London Road and John Hood Ltd at 14 London Road, March 1951. Photo © John H Meredith, used by permission. Royal Navy recruitment advertisement on page 3 of the 11 March 1949 Kent & Sussex Courier . Image © Local World Limited, created courtesy of The British Library Board. Reproduced with kind permission of The British Newspaper Archive. There’s evidence that part of the building was used for military and/or governmental purposes in the 1940s to 1970s — a Royal Navy recruiting office in the late 1940s, the Ministry of Labour & National Service in the mid-1950s, an Army, WRAC, RAF, and WRAF recruiting office around 1960, and the Croydon North local offices of the Ministry of Pensions & National Insurance around 1970. The Ministry of Labour & National Service was on the ground floor at number 12, but my suspicion is that some of the later governmental use was mostly or entirely confined to the upper floor of the building, which has a separate entrance to the left of number 14. Meanwhile, John Hood, dyers and cleaners, had arrived at number 14 by 1955; and by 1960 this had been joined by Dixons Photographic at number 12. John Hood remained until the early 1970s, and Dixons persisted until the mid-1970s. John Hood was replaced by Wickham Super Stores, a “self service drug store” which was in place by mid-1971. Dixons Cameras and Wickham Super Stores at 12–14 London Road, 17 November 1971. Photo © John Parkin, used by permission. 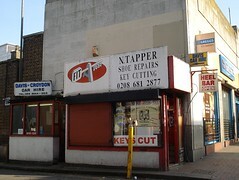 By mid-1977, number 12 was occupied by New Olympic sports shop, which moved here from numbers 158–162 just up the road. By 1980, New Olympic had become Billy Aird Sports Ltd, and number 14 had been taken over by Allans Drug Store. Number 12 continued as a sports shop for some time, although the name changed over the years from Billy Aird to Riverside Sports to Alan Ross Sports. Number 14, however, swiftly transformed to a betting shop. It had a brief stint in the early 1980s as John White betting office, but in October 1983 it became a branch of Ladbrokes, which it has remained ever since. Alan Ross Sports at 12 London Road and Ladbrokes at 14 London Road, 1989. Photo © Brian Gittings, used by permission. Alan Ross remained at 12 London Road until the early 1990s, when it was replaced by a women’s clothing shop called City Girls. By 1999, the occupant was a Chinese medicine shop, initially called Herbary Chinese Medicine and later Herbs & Acupuncture. This was still in place when I moved to West Croydon in mid-2011, and as I’m particularly interested in Chinese food, I shopped there a couple of times, though sadly I have no photographs of my purchases to show you. The most recent thing I bought from there was a packet of Chinese red dates, which I used to make eight-treasure vegetarian soup. Herbs & Acupuncture, 12 London Road, December 2011. Photo: author’s own. 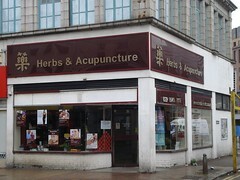 Herbs & Acupuncture closed in mid-2012, and was boarded up by the end of August (see photo). The premises didn’t remain empty long, as by mid-October H&T Pawnbrokers was firmly ensconced. Today, as well as Ladbrokes and H&T Pawnbrokers, the building is home to a branch of the Universal Church of the Kingdom of God. Members can often be seen standing on London Road offering leaflets to passers-by. 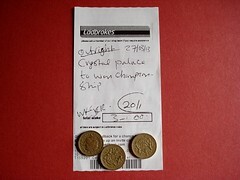 Betting slip from Ladbrokes, 14 London Road, March 2013. (£3 on Crystal Palace to win the Championship, at 20/1. Sadly this didn’t happen.) Photo: author’s own. Thanks to: Henry Braun for additional research; Brian Gittings, John H Meredith, and John Parkin for use of their photos; Colin Withey for providing a scan of John H Meredith’s photo; Ewan Munro for alerting me to the existence of the locally listed buildings website; Matthew Kiernan at Croydon Harriers for advice on placing a bet; Richard Royal at Ladbrokes plc; the Planning Technical Support Team at Croydon Council; all at the Croydon Local Studies Library; and my beta-readers Clare, Flash, and Kerry. In addition to the evidence of street directories, I have Henry Braun to thank for further thoughts on the construction date of the building. He notes: “metal-framed Crittall windows are typical of the 1920s and 1930s. The upper storey at the front looks very inter-war: it's not got the fussiness of pre-war decoration but from the second war onwards the tendency is more and more to make any detailing just a flat skin over a boxy frame. For this building you can make a precise guess at the date because the ‘Egyptian’ elements in styling, like the cartouches, bundled papyrus and pediment visible around the entrance to the left of Ladbrokes, were a fashion characterising early Art Deco and a reaction to the discovery of Tutankhamun's tomb in 1922, brought into architecture by the Paris Exposition of 1925. So this building is very unlikely to be before 1926, I'd imagine, but if so it was bang up to date. Having said that, it’s possible that the ‘Egyptian’ detailing was bought from a supplier's catalogue late in construction and with a fairly short lead time. So maybe they were finishing the build in mid- to late- 1925, and refined the design at a late stage with the most fashionable cladding elements they could find.” Henry also suggests Art Deco House Styles by Trevor Yorke and Rice's Architectural Primer by Matthew Rice as further reading. There’s a picture of the older building around 1920 on p17 of Croydon’s Transport Through The Ages (CNHSS, ed. John Gent; this photo is also present in the Croydon Local Studies Library collection, ID PH/03/001). The caption calls it the “London and Croydon Railway Offices” and notes that it was demolished “around 1924”. Photo PH/02/5078 (or possibly PH/02/5073) at the Croydon Local Studies Library shows another view of the building. The 1924 Croydon Times Xmas Shopping Guide (shelfmark qS70 (658.8) CRO at Croydon Local Studies Library) has another photo, with a caption saying it was formerly the administrative offices of the London and Croydon Railway, later used as the stationmaster’s house, and “pulled down this year [i.e. 1924] to make room for improvements”. A postcard at the Local Studies Library (PH/07 1667) shows a drawing of the building by E A Phipson, dated 1923, labelled “Station Master’s House West Croydon”. Before 1927, numbering of London Road on the east side started at the modern number 16, which was number 2 then. It’s possible that Station House wasn’t given a number immediately because a number such as 2a would have been a bit misleading given the size of the building, and the town planners knew that the renumbering was coming soon anyway. It’s also possible (see footnote ) that Station House was not in fact 12–14 London Road, and that 12–14 were constructed later. However, I consider this unlikely given that there’s a contemporary source (see footnote ) stating that the older building was demolished in 1924, and I can’t think of anywhere else that John Bright and the billiards hall could have been. Evidence that the billiards hall was on the first floor is circumstantial, but this seems the most likely location to me. Photo PH/96 2568 in the Local Studies Library, dated on the back as “c.1930”, shows wireframe signs on the roof of the building for “John Bright Outfitters, Cut Above Tailors” and “Billiards”; there’s also a partially-visible sign in one of the first-floor windows reading “BILL---”. Photo PH/96 2400, dated on the back as “between 1934 and 1937”, shows another “Billiards” sign projecting at first-floor level on the southwest corner of the building. John Bright (Outfitters) Ltd is listed at 172 North End in Ward’s 1937 and 1939 and Kent’s 1955 and 1956 directories. It’s just visible in Effie Fotaki's “then and now” photo of the station (next to Stylo). Numbers 166–174 North End were built in the early 1930s as part of the redevelopment of West Croydon Station. It seems John Bright made a habit of moving into newly-constructed buildings! Information in this paragraph comes from Ward’s street directories for 1934, 1937, and 1939, consulted at Croydon Local Studies Library. John Bright is listed at 12–14 in 1934, N Davis is listed at 12 in 1937, and Nu-Enamel and Mason’s are listed at 12 and 14 in 1939 (note that the data may have been gathered in the year previous). Further corroboration comes from photo PH/96 2400 from footnote , which is dated between 1934 and 1937, and shows “Davis” or possibly “N Davis Ltd” on the frontage of number 12. The next street directory available at the library is Heath’s 1949, which as far as I can see contains no reference to 12–14 London Road. The next after that is Kent’s 1955 (see main article). An advert in the 11 March 1949 Kent & Sussex Courier (reproduced here) gives an address of 12 London Road, Croydon, for a Royal Navy Recruiting Officer. Kent’s directories for 1955 and 1956 list “Embassy Hall — Ministry of Labour & National Service” at numbers 12–14, Heath’s 1960 directory lists an Army, WRAC, RAF, and WRAF recruiting office at number 12, and Blair’s 1972 directory lists “Ministry of Pensions & National Insurance, Croydon North Local Offices” at 14a. See John H Meredith’s photo for evidence regarding the Ministry of Labour & National Service. Kent’s directories give an address of 12–14 London Road for this, so perhaps it also used the upper floor. Blair’s 1972 lists other businesses at numbers 12 and 14 (Dixons and John Hood). The church on the first floor of the building today advertises its address as 12–14, and Goad plans from 2002 and 2011 (viewed at the Croydon Local Studies Library) suggest that 12–14 has been used as the address of the upper floor for some time now. The entrance to the first floor is labelled with numbers 12 and 14 on the walls on either side (see photo from 2011). John Hood is listed at number 14 in Kent’s 1955 and 1956 directories, the 1967 and 1971 issues of the Croydon Classified Directory , and Blair’s directories for 1969 and 1972 (note: the dating of the 1969 Blair’s directory is speculative — there’s no date in the copy at the Croydon Local Studies Library, but a handwritten note inside suggests 1969). Dixons was in place by 5 August 1960, as the Croydon Advertiser of this date has an advert for it on page 2; it’s also listed in the 1967, 1971, and 1974–5 issues of the Croydon Classified Directory , and Blair’s directories for 1969 and 1972. The Central Croydon Goad plan for August 1974 lists “Mark Down cam + audio” at number 12 and “Wickham Super Store — toiletries” at number 14. A photo at Croydon Local Studies Library dated 10 November 1974 (ref PH/96/2418) shows part of the frontage of number 12; the signage is mostly obscured, but seems to read “Ma[...] [another word] Discount Came[...]”, which given the above is almost certainly “Mark Down Discount Cameras”. I suppose “Mark Down” is probably a reference to the discount nature of the business rather than the name of a person. Phone books list New Olympic at 158 London Road up to and including the January 1976 Croydon edition, and at 12 London Road in the July 1977 Croydon edition and the 1978 Bromley/Orpington edition. A journal written in 1980 by Brian Gittings lists Billy Aird (sports goods) at number 12 and Allans Drug Store Ltd at number 14. A planning application for number 14 (ref 82/1682/A) consulted on microfiche at Croydon Council offices includes correspondence dated 18 November 1982 referring to “the adjacent premises, Riverside Sports”. A photograph included in the same application shows “self service drug store” on the facade at number 14. The 1984–85 London Shop Surveys (published before 1 November 1983, according to the acquisition date of the copy at Croydon Local Studies Library) lists Riverside Sports at number 12 and John White betting office at number 14. The March 1983 Goad plan lists Riverside Sports at number 12 and Wickham Super Stores at number 14. 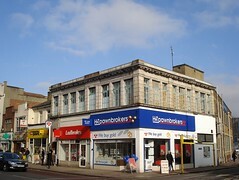 According to Richard Royal at Ladbrokes plc, Ladbrokes opened at 14 London Road in October 1983. The March 1984 Goad plan lists Alan Ross Sports at number 12 and Ladbrokes at number 14. Ladbrokes also appears in subsequent Goad plans for the area, as well as the London Shop Surveys of 1986–87 and 1988–89. The September 1999 and May 2002 Goad plans list Herbary “natur thpy” at number 12, the second edition of Shop ‘Til You Drop (probably published around 2002) lists Herbary Chinese Medicine, and Google Street View from July 2008 shows Herbs & Acupuncture looking very similar to my photograph from December 2011. A photo at the Croydon Local Studies Library (PH/02 642) shows part of the signage at number 12 with white letters on light green background reading “He...” with “Chine...” below, looking very similar to a photo on the Croydon locally listed buildings website (which unfortunately is no longer accessible on the internet). The library photo has a slightly unclear handwritten date which could be either 1/8/01 or 1/8/08, but given the evidence of Google Street View it’s clearly the former, i.e. 2001. Information about closure of Herbs & Acupuncture and opening of H&T Pawnbrokers is from personal observation. It’s perhaps of interest to note that a couple of years ago, the council refused planning permission for a betting shop to open at this address (ref 09/02003/P; see PDF of their Decision Notice), stating that it “would result in an undue concentration of non-A1 uses within the designated shopping parade, which would be detrimental to its retail function and vitality”. Class A1 in the planning system covers retail use, while betting shops and pawnbrokers come under Class A2 (financial and professional services). However, pawnbrokers can often sneak themselves into Class A1 by claiming that jewellery sales form a significant part of their business, meaning that they can open up in closed-down retail premises with no need for change-of-use permission to be granted. The church received planning permission on 2 December 1999 for “use of rear ground and first floor as Christian centre”. This planning application (ref 99/2393/P, viewed on microfiche at Croydon Council offices) states that as of the date of the application the relevant space was vacant. Alongside the Greggs branch at West Croydon Station, just around the corner from London Road, sit a couple of small kiosks, firmly attached to the concrete side wall of the building. 13–15 London Road was built in 1863, as part of a block with numbers 17, 19, and probably 21. At this point, the lots on either side of this block hadn’t yet been built on, and the nearest neighbours fronting on London Road would have been at numbers 5 and 31.